Cleaning products are one of the main amenities in every home. We try a lot of cleaning products in order to get the one that works the best for us. However, most of the times we are not sure whether the ingredients are 100% safe for us and our kids or not. Instead of just trying several cleaning products that may or may not work, you can simply make them at home with simple ingredients. That way you can be sure that it is totally safe and eco-friendly, and will definitely clean your home even better than cleaning products. Making your own cleaning products at home will help you save a lot of money and can definitely be guaranteed. Here are some DIY home cleaning supplies that every home must have. If you have a favorite rug at home that has a stain on it, and you’ve tried different products and you think it’s impossible to remove, then you should consider trying this easy recipe. Supplies: Water, White Vinegar, baking soda, scrub brush, spray bottle (glass is preferable), and Vacuum cleaner. Cover the entire stain with a layer of baking soda. Then spray the mixture you’ve made with the water and white vinegar. The baking soda and the mixture will start to foam up. You should leave it for three hours. After three hours, scrub the part that has the stain with the scrub brush and let it dry overnight. The next day you will find a bit of the baking soda still on the stain but the mixture of water and white vinegar should be dry. Remove the baking soda with a vacuum cleaner and then gently scrub the part that it has the stain with a clean cloth. Cleaning the toilet can be one of the difficult things to clean because most cleaning products are either harmful to our lungs or skin with the long term use or they don’t clean well. Having a homemade cleaning product that cleans the toilet will save you not only money but the effort of finding the right product that cleans and at the same time is not harmful. Here is a simple recipe you can use at home in order to clean your toilet. Supplies: tea tree oil, baking soda, white vinegar, spray bottle, paper towels, and a toilet brush. Mix the tea tree oil with one cup of white vinegar in the spray bottle. Spray the mixture all over the toilet seat, bowl and anywhere you want to clean it. After spraying the places that needed to be cleaned, sprinkle baking soda at the same places you sprayed and then brush it well. Use the paper towels to wipe all the areas that you sprayed with white vinegar in order to remove it and you will have a clean and harmful toilet. We use mirrors more than we think we do and it is very important that our mirrors are clean all the time if we want clear reflections. However, glass and mirrors can easily have spots that ruin the look. That’s why it is important to always keep them clean. This recipe will help you have clean and shiny glass and mirror surfaces. Supplies: corn starch, white vinegar, rubbing alcohol, warm water, spray bottle, microfiber cloth or newspaper. Mix a quarter-cup of rubbing alcohol with a quarter-cup of white vinegar and two cups of warm water and add one tablespoon of cornstarch. Mix them all together in the spray bottle and shake well so that they are well mixed. Spray the mixture onto the glass surface or mirror you want to clean. Wipe the glass surface or mirror that you sprayed the mixture on with the microfiber cloth or newspaper, and you will have a shiny and clean glass surface again. Know that, every time you want to use this mixture you have to shake it before using it. Mix a half cup of white vinegar with a quarter-cup of baking soda and two liters of water. Combine the ingredients well and make sure they mix. You can divide the mixtures in spray bottles so it would be easier for you to use. Spray the mixture onto the parts that need to be cleaned and brush well. Cleaning products can be harmful to your lungs, eyes or skin. 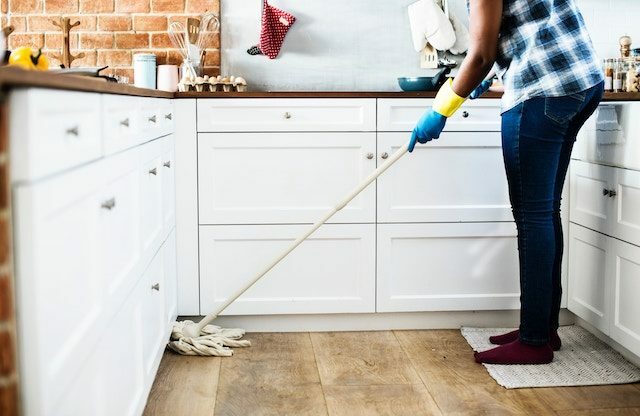 It is always preferable to make your cleaning products at home so that you would be sure of the ingredients and you know exactly how to use it. The most important ingredients when you’re creating a cleaning product are white vinegar and baking soda. Both are powerful in cleaning, and they can remove a lot of stains and dirt from your home. When using them right you can save you a lot of time and effort. ← What are Recycled Tires Used For?